Gold RV offers Holley Glassup a drive at this Year’s Flame & Thunder Show, at Santa Pod, to help raise funds for the NSPCC. 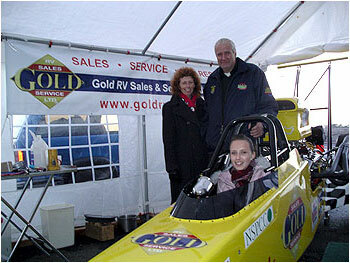 Aged 16, Holley Glassup could be the youngest ever fully licenced UK racer to compete in a 150MPH dragster. Derek Flynn, the usual driver of the 150 MPH Gold RV sponsored dragster, has given up his seat at this years Flame & Thunder to one of the youngest UK drag racers ever! Holley Glassup who had her 16th birthday in September, and promptly applied for her licence. Holley is no amateur though, in fact she has been drag racing in the UK and even Europe since she was 10. Competing first in Stock Junior drag racing before moving on to the Super Modified Class, capable of speeds in excess of 75MPH in an 1/8th of a mile. Gold RV agreed to offer Holley the seat once they heard of her wishes to be one of the youngest fully licenced drag racers in the UK, providing she helped to raise funds for the NSPCC, Holley agreed and the plan was put into action. We would like to thank the MSA, Santa Pod and the SPRC, especially Paula & Ian Marshall for their help in entering Holley at this years Flame & Thunder. Gold RV Racing have been fund raising all season for the NSPCC and proudly displays the NSPCC logo on their car. So please sponsor Holley’s Ride and all the proceeds raised will go to the NSPCC full stop campaign. Please fill in one of the Teams sponsor forms or telephone 01420 544 482 and donate by phone. Thank you in anticipation of your support !